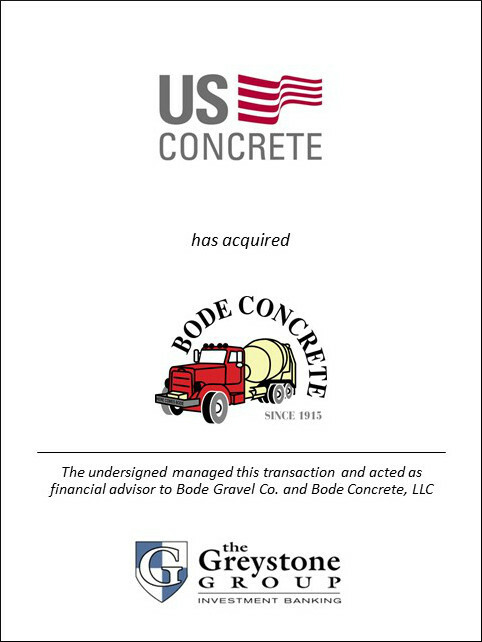 SAN DIEGO (October 2012) – The Greystone Group announced today that it served as exclusive financial advisor to Bode Gravel Co. and Bode Concrete LLC (collectively “Bode”), in its sale to U.S. Concrete, Inc. (NASDAQ: USCR). Bode is a premier supplier of concrete in the San Francisco Bay Area. With two ready mix plants and a fleet of 41 mixer trucks, Bode produced approximately 243,000 cubic yards of concrete in 2011. U.S. Concrete acquired Bode for a purchase price is $24.5 million payable in cash at closing, subject to adjustment for working capital, plus potential earn-out payments contingent upon reaching negotiated volume hurdles, in an aggregate amount of up to $7 million (plus accrued interest, if any) payable over a six-year period. “Greystone’s proven knowledge of the construction materials industry and dedication and active participation throughout the process was critical to the successful completion of the Bode transaction” said Dan Boardman, president and shareholders’ representative of Bode. This marks the 4th construction materials transaction managed by Greystone this year.